The Enterprise D from Star Trek: The Next Generation. 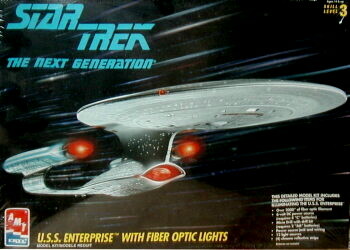 This is the version of the kit that comes with a fiber optic lighting system. This requires a little extra work on the part of the modeler. Please note, this is a vintage kit and no longer in production. Boxes may be warped due to shrink wrap and age. Boxes may have some dings due to age. Decals may be unusable. Replacements are simply not available. Although it is factory sealed and believed to be complete, it is sold "as is" and cannot be returned.